These days, a lake home is so much more than just an escape over the summer. For many Northwoods part-time residents, their vacation homes are becoming a year-round destination— hikes in the fall, snowmobiling and holidays in the winter, and enjoying the outdoors and the lakes in the spring and summer. Such is the case for Renee and Jay Jepson’s second home on Pelican Lake in Antigo. Renee says the family is there weekly throughout the year, with extended stays over the summer. The couple and their two kids, Kayla and Jack, like that the home is just under a three-hour drive from their West Bend home. “We’re up there as much as possible,” affirms Renee. Their connection to the area started when Jay was just a boy, when he used to fish on Pelican Lake. It continued when Jay came up to the lake for years to visit friends—and then after Jay and Renee married, they bought their own cottage on the lake on their current property in 2002. The couple wanted a home that could host guests comfortably, and be a respite from their busy day- to-day lives back at home. However, the family faced an immediate challenge upon the start of designing their home. Pelican Lake is a spring-fed lake, and some of those springs run through their property—so they had to work with Northwoods Excavating LLC, a local company, to ensure that the water was effectively managed. The couple chose Ripon-based Pollesch Construction to design and build the home. In the design, they wanted to marry touches of a traditional Northwoods home with a modern, contemporary feel—or, “nostalgic contemporary,” as Jay calls it. Traditional accents are heavily used throughout—including in the stone fireplace surround (which also pops up in the kitchen), dark vinyl plank flooring, stacked-stone accent wall and reclaimed barn board used on the great room ceiling. 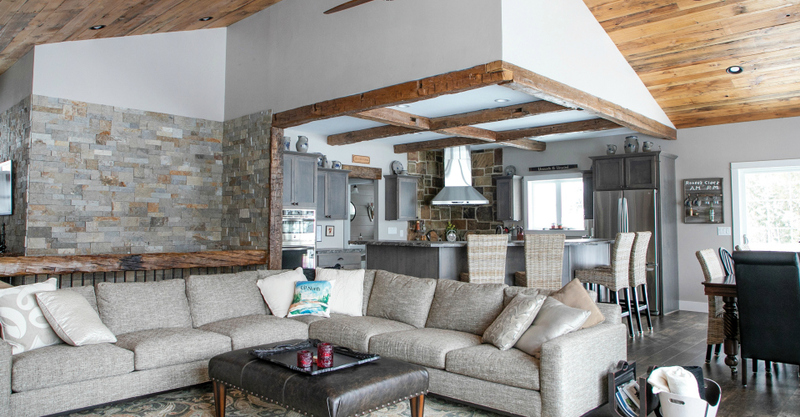 Reclaimed barn beams were used in the kitchen, fireplace mantle and downstairs railing. The couple effectively blended that classic cabin style with updated décor in the light gray wall color, mixed-material furnishings (like the fabric couch, leather ottoman and rattan accent chairs), gray-wash kitchen cabinets and white built-in bookshelves next to the fireplace. “I wanted those white bookshelves because the things on display have a meaning or value to us of some sort, so I wanted a place to be able to see all of it,” says Renee. But the memories aren’t just confined to upstairs. Step downstairs and the entire lower-level entertaining area is an homage to the family’s time on Pelican Lake—many of which started when Jack was just two years old (see images on pages 42 and 43). Framed photos of family and friends are in chronological order starting from left to right. Peppered in between the photos are decorated wooden paddles and toilet seats from friendly competitions during summer and winter “Olympics” the family held. Vintage water skis hang throughout the space too—including a pair used in the hanging light fixture over the pool table that a set of friends had custom-made for the Jepsons. Coincidentally, the type of ski used in the fixture was the first pair of skis Jay learned how to water-ski on, unbeknownst to their friends—another cool, personalized touch to the room. Guests and family can also belly up to the bar made out of an actual old 19-foot-long ski boat for a drink or snack. Hanging pendant lamps that look like buoys hang above the bar for an extra-special nautical nod. More memorabilia hangs behind the bar of favorite places and family memories. Hand- written on the stairs behind the bar is the exact latitude and longitude of the home. 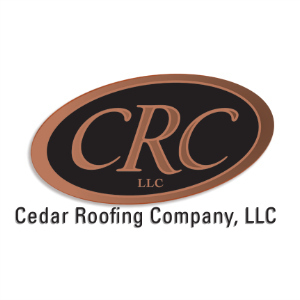 It’s a fitting touch to this special place that the family treasures year-round for decompressing from daily life, laughter and fun. 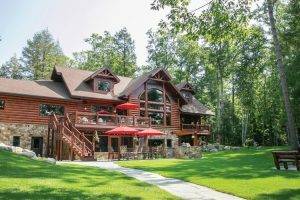 This home was featured in the Northwoods: Spring 2019 issue. For more photos of featured Northwoods homes, visit the Northwoods gallery.